There are many types of parasites that are found in the GI tract of cats and dogs. Worms such as roundworms, whipworms, and hookworms are very common in almost all parts of the world. 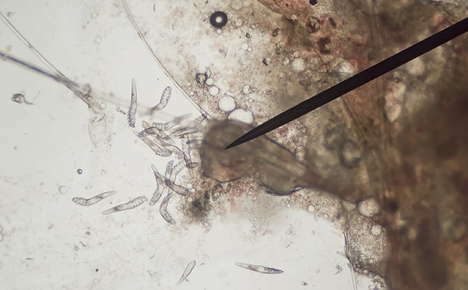 These parasites shed their infective eggs in the pet's stool and contaminate the environment; some eggs can live on yards or fields for years. The eggs are ingested by the pet and the life cycle is completed when the worm grow into an adult in the intestine of a new host. Tapeworms are another very common intestinal parasite of dogs and cats. This parasite is different though, in that it requires transmission through an intermediate host, most commonly a flea. Other intermediate hosts can be mice, rats, or rabbits. The dog or cat eats the intermediate host containing the tapeworm egg, and the tapeworm completes its life cycle to develop into an adult in the intestine of the dog or cat. The intermediate host is required, if a pet eats an adult tapeworm or tapeworm segment, it will not cause tapeworms to grow in its intestine. Other parasites can live in the intestine that are not worms such as one-celled organisms called protozoa, which are also prevalent parasites among pets. Giardia and coccidia are protozoa that can be transmitted directly from animals to your pet, or your pet can be exposed from contaminated water. Diagnosis of these parasites requires your veterinarian or their laboratory finding either the microscopic parasite or its egg in the stool. The only parasites that can be seen in the stool with the naked eye are roundworms and tapeworms. Roundworms are ivory colored, round (not flat) in shape, and about 4 to 6 inches long. Tapeworms are ivory colored and flat in shape. The adult tapeworm is several feet long, but usually you see only tapeworm segments that look like either sesame seeds or rice. Your pet could have either of these worms without the adult parasites ever being shed into the stool. If your pet's stool looks normal, don't think your pet can't be infected. There is no one drug that can kill all types of intestinal parasites that exist. Your veterinarian needs to know what kind of parasite(s) infection is involved, so a correct drug can be prescribed. Also, some of the monthly heartworm preventatives will also treat roundworms, hookworms, and whipworms. If you suspect that your pet may be affected, don't hesitate to contact your veterinarian today for direction on what to do! Your veterinarian will also be able to answer all your questions and help you prevent your pets from getting parasites in the first place.